Last week saw the launch of a new Nga Haerenga/ New Zealand Cycle Trail: the Rimutaka Trail. The trail starts by following the GHW along the Petone foreshore, then branches off up the Hutt River Trail, to cross the ranges on the Rimutaka Rail Trail, returning by following beside Lake Wairarapa to Ocean Beach, then around the Coast to Orongorongo Station and the Wainuiomata Road (the final section past Orongorongo station is not yet officially open). It is possible that if land issues can be sorted out, the trail will extend to follow the coast from Baring Head to Pencarrow and Eastbourne. The new trail can be combined with the GHW. 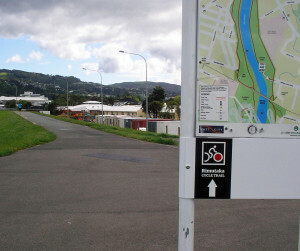 The GHW provides a connection from the Wellington CBD to the trail, although at the moment this is on the unattractive SH2 expressway from Ngauranga to Petone. NZTA is working on plans for providing a comfortable walking and cycling alternative for this. If the Rimutaka Trail is extended to Pencarrow, it will link with the GHW at both ends.